Herding Cats: Just a Waiting Game. I was seen by the midwives yesterday. They came to run through the home birth and check that all my medical gases and drugs had arrived. I have four cyclinders of entonox, each will last approx 20mins, so here's hoping for a quick delivery. I had finally set up the bedroom with a table we use for camping, an angle-poise lamp and collected towels together etc. During my check- my sugar levels were normal- yipee. Gestational diabetes was something that I was dreading because I know that my diet is just so bad at the moment, I am eating so much sugar and my weight is not what it should be. To be told that I had to buck my ideas up would have been terrible. The battle of the bulge will begin in earnest after Christmas. 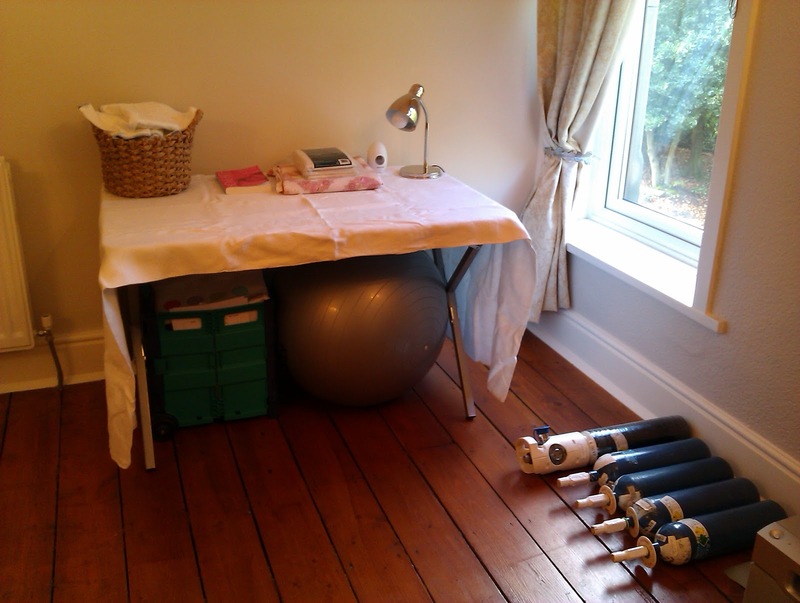 Blood pressure was perfect and the baby's head had 'engaged'- fabulous. Mum had kindly taken Freya for me earlier in the day so that I could hoover up. It feels great as all of the upstairs is de-cluttered, sorted and now clean- so just need to keep on top of it for the next few weeks. The only jobs that I hadn't done were cleaning out my fridges and one of the places that the midwife saw...I was desperately trying to smuggle the drugs out of the fridge through a tiny crack in the door so she wouldn't see my mouldy grapes and week old spaghetti primavera. I got up early to do one fridge this morning and have a date with the beer fridge tomorrow morning. Freya has been an absolute delight today. Last night I felt 'aggitated'- maybe because everything is set up and now I want it over, but today I have just felt exhausted. Some days Freya is a whirlwind and is trashing things faster than you can put them back and telling her off again and again is soul destroying. She has been as calm as a Hindu cow today. I managed a twenty minute bath while she played in her room, only twice coming to scoop water out of the bath and throw it on the floor. We went to the park where she ate her weight in duck bread- I don't know when she will understand the concept of throwing it. She also enjoyed her first game of chase with a little boy, Oliver. Oliver was a really sweet three year old but his jeans were so short it made me a little sad. I wondered if his mum didn't have much money. She was nice too. After this tiny walk, I was tired again and Freya let me enjoy a coke in the garden while she played quietly with worms and spiders. Lunchtime saw a little more drama with her having her first 'choke'. She had pork chops which were just a bit too chewy. Bless her for trying but after two failed chews she tried to swallow a piece- which rapidly got stuck. Her face had changed from red to purple by the time I had got the straps of the chair off and her eyes looked kind of vacant. The sensible nurse in me knows that even if the child becomes unconscious, the airway relaxes and you can usually get the object out with back slaps- but it doesn't stop you panicking anyway. Luckily, she has a strong enough survival instinct and managed to dislodge it. I chucked the rest of the meat in the bin. 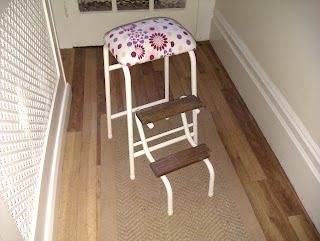 I have finally completed, or should I say we (as in me, mum and dad) my stool revamp project. My Nan had a step stool in her kitchen when we were little. We used to sit and eat our tea on it and do the washing up knelt on it- lots of nice memories. When Craig and I got our first house together in Toft Street (Liverpool) mum and dad re-sprayed and covered the stool for us. Many years later, having neglected it and decorated on it etc, it needed another face lift. I decided to go for pale matt colours- more form over function but nevermind, I love it. Spray painting it was a challenge. I won't be going down the spray paint aisle at B and Q for a while. It took seven or eight coats. Craig couldn't understand why I hadn't abandoned the idea and bought a new one. Firstly, I like to 'make do and mend', secondly, it's nice that the furniture has a bit of history and thirdly, I haven't seen anything like it. I would like Freya to grow up doing the washing up on it. The Valley of the Dolls.